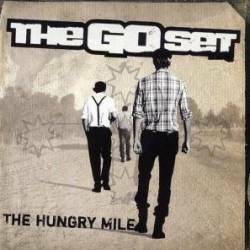 The Go Set have already reached a breakthrough in their native country Australia and in New Zealand. Their two albums reached the top 10 of the national indie charts and they got the opportunity to play at big down under open air festivals and had the chance to support acts like The Stranglers, The White Stripes and Reel Big Fish. When I'm listening to their second album The Hungry Mile, I'm pretty sure that the situation can become the same in other continents. An Australian magazine described them as Peter Garrett (Midnight Oil), The Pogues and The Clash having a late night jam in a local pub with an endless supply of booze. This is quite close to the real situation, which means that you can expect a classic mixture of punk, rock and folk. Although a lot of folk rock bands often have the tendency to be too wimpy (Levellers, The Seer,...), The Got Set prefer to rock and so it doesn't surprise that the entire album was recorded in under a week. After a short Celtic intro which sets you into the right mood, The Go Set play a lot of fast rock songs making you feel like drinking (Bordeaux, Davey, Salamanca,...). Some songs have a stronger punk attitude showing parallels to Rancid and The Clash (All The Truth And Lies, The Power Of Youth). Furthermore, there are two acoustic tracks (The Hardness Of His Hand, Learning Slowly), the Irish influenced Tale Of A Convict sounding like Skyclad, a worker hymn (Union Man) and even a Christmas song (Scarlet Snow). Another interesting aspect on The Hungry Mile is the vast panoply of instruments. The traditional rock instruments are joined by mandolins and bagpipes. Especially funny is the bag piper's name (Johnny Rotten McHaggis). The last folk rock album I liked very much was the latest release by The Tossers, but the Go Set are able to top that one without problems.